SPOKANE, Wash. (AP) Gonzaga University won permission from the city to build a $48 million science and engineering building near the campus' Arthur Lake, but the university is still raising the funds to pay for construction. In a decision issued Feb. 19, Brian McGinn, the city's hearing examiner, approved the project, allowing the three-story building to be constructed within 200 ft. of the lakeshore, which required his permission under the city's law regulating development along shorelines. A final determination for this project in regard to the shoreline rules will be made by the state Department of Ecology. The 80,000-sq.-ft. building, called the Integrated Science and Engineering Center, is the latest installment of a building boom on campus. The university recently constructed the $24 million Volkar Center for Athletic Achievement and the $13 million Della Strada Jesuit Community residential building. Work on the $30 million, 57,000-sq.-ft. Myrtle Woldson Performing Arts Center is anticipated to be complete next year. Thayne McCulloh, president of Gonzaga said the university hoped to raise half of the nearly $50 million needed to build the new science center. The other half will come from the university's cash reserves and restructuring debt. In November, the university said it surpassed its two-year fundraising goal by bringing in $286 million. McCulloh said the work to raise more money for university construction and scholarship programs will continue through April or May. The new science building will be an interdisciplinary academic effort that brings together faculty from the university's College of Arts and Sciences and the School of Engineering and Applied Sciences. A range of subjects will be taught in the building, and ongoing student research projects will be on display for all to see. McCulloh said the idea was to develop programs beyond the “bedrock” disciplines currently offered at Gonzaga. In addition to mechanical and electrical engineering, students would be able to study bioinfomatics and materials science. The building will have four types of learning spaces: general classrooms, project areas, teaching labs and research spaces, according to SRG Partnership, a Portland-based architectural company that helped design the project. A large central “gathering space” on the ground level will be designed to “create a studio atmosphere” to display ongoing student projects and research. The science center isn't directly linked with the growth in the nearby University District, but is “very much related programmatically,” McCulloh said. Earlier this month, Eastern Washington University announced plans to move three degree programs and around 1,000 students from its Cheney campus to a building along East Sprague Avenue on the south side of the University District that it said allows for growth in its science and engineering departments. “We obviously do what we're doing in close relationship not only with Avista but with our colleagues at WSU and other institutions, developing things with an intention to be a partner with what is being developed and offered,” McCulloh said. Gonzaga's new building will connect to the existing Paccar building to the east and, via skywalk, to Hughes Hall to the north. 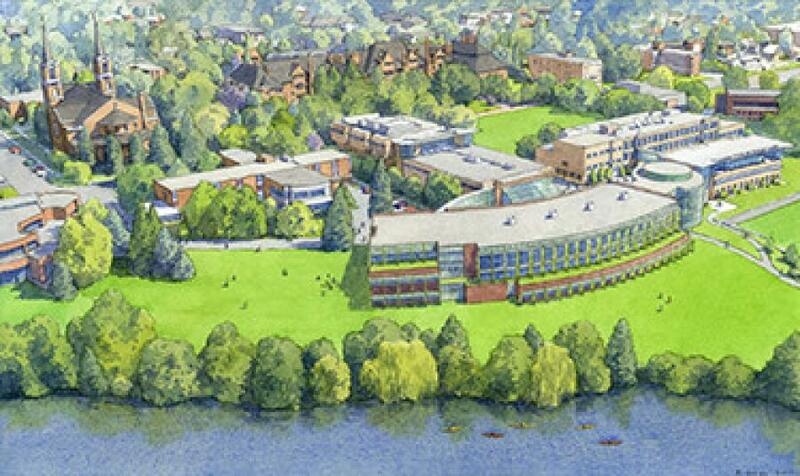 The land is zoned for high density residential, and McGinn, the hearing examiner, said Gonzaga's plans for the science center are “allowed outright” in this use of land and required no rezoning. McGinn also noted that public access to the lake won't be affected, since the paved trail running on its southern front won't be changed and the lake is wholly owned by the university. Lake Arthur wasn't always a lake. For many years, it was an inlet of the Spokane River used to store logs for the McGoldrick Lumber Co., which bought a mill on the site in 1906, part of the 60 acres the lumber company owned along the river. After a fire in 1945 destroyed the plant, Gonzaga purchased the land and closed off the inlet with a dam made of rocks, creating the lake.